The Arbor Company is thrilled to announce that our own Chris Harper has been awarded Argentum’s prestigious 40 Under 40 recognition. Chris is a zealous innovator in the field of senior living, and we’re so lucky to have him. As Arbor’s digital marketing and brand leader for more than five years, Chris has spearheaded innovative strategies that reflect our unique, forward-looking approach to senior living. Dispelling stereotypes about seniors, senior living, and aging is not easy. Chris has managed to do it in just a few years, presenting Arbor as the vibrant community it is and showing seniors that retirement can be whatever they make it. The Best Engagement Activities Your Senior Living Residents Will Love! Seniors are as diverse and unique as every other age group — perhaps even more so because they’ve spent a lifetime learning, cultivating new interests, and accumulating wisdom. The transition to senior living should offer new and better opportunities to cultivate an active and engaged lifestyle. Research consistently shows that a wide range of activities can improve health. Socially connected seniors may live longer and healthier. Physically active seniors experience reductions in the risk of virtually every disease, including dementia. A job in senior living offers the chance to touch a senior’s life, help a family navigate the challenges of caregiving, and honor a senior’s life’s work. Senior living also comes with an enormous dose of job security. An aging population means that by 2025, more than a million new senior living positions will open up. There’s something for people of all backgrounds and skill levels in this important line of work. Whether you’re using medical training to offer exceptional care, harnessing customer service skills to ensure seniors find the right senior community, or channeling a lifetime of culinary training into healthy cuisine for elders, there’s an opportunity for you to put your gifts and interests to work. According to the U.S. Department of Labor, growth in senior living jobs outpaced growth in other careers by 3.7 percent between 2000-2010. Over the next decade, senior living will see an explosion in career opportunities as the population continues to age. By 2025, the industry will need at least a million new employees. Whether you’re just starting out or ready to consider a career transition, a career in senior living offers job security, numerous opportunities, and a chance to make a difference. What Is It Like to Work in Assisted Living? People considering careers in senior living are committed, thoughtful people from all walks of life and with a wide range of educational backgrounds. Many are eager to learn what a typical day looks like. The truth is, there’s no such thing as a typical day. In fact, that’s what makes assisted living careers so rewarding. There’s always a new question to answer, a new person to help, a new skill to learn. In this special episode of Senior Living LIVE! we're talking about working in senior living. Join us as Edwin talks about his career from being a nurse to an executive director. Watch below or read the transcript of our conversation. According to the United States Census, seniors will outnumber children for the first time ever by 2035. There will be 78 million seniors, and 1 in 5 Americans will be 65 or older. This means that careers in senior care will only grow. Many career paths in senior care are already experiencing a critical worker shortage. Senior living jobs offer job security and a chance to improve the lives of seniors and the people who love them. There’s no substitute for the wisdom that comes with lived experience. Seniors are rich repositories of a lifetime’s worth of experiences, historical events, and lessons learned from mistakes, tragedies, and triumphs. Senior living jobs present the chance to learn from seniors what no book can teach, and to ensure that our elders’ final chapters are dignified, meaningful, and happy. Between now and 2060, the number of seniors over the age of 65 is expected to double. Aging baby boomers and a growing population will need care over the next several decades. Whether you’re just starting your career, hoping to make a change or seeking a chance to find meaning in work you already do, senior living jobs offer a wide range of rewarding options. 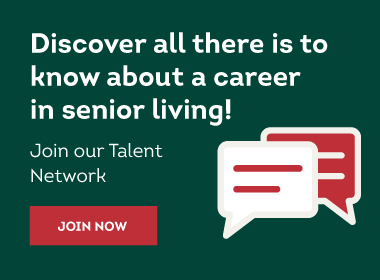 Learn how you can ignite your career in senior living! © Copyright 2019. The Arbor Company. All Rights Reserved.